I jumped from my bed like a jack rabbit out of a fox hole. A rare moment indeed, both feet landing firmly on the soft carpet below my bed. It would have been a prefect landing after a few spins on the parallel bars. Usually it takes me at least 45 minutes just to work one leg from underneath my warm protective blanket, but today something was different. As I stood firm, still admiring my 10 point landing, the toy chest my Dad left in the far corner of my bedroom began to rumble and shake frantically once again. I guess they want to get out. Why can’t they just stay quietly in the toy chest? I wondered if I was crazy to be having conversations with them. They seem harmless, atleast, and I do enjoy our long talks. So, I guess that sorta means we can be friends. I should let them out before Mom hears them and comes to investigate all the noise. “Okay guys, I’m coming,” I call out, as I moved toward the shaking, rumbling chest. Dad told me it’s a special toy chest with lots of great stuff inside. What did he mean by special? I figured the old guy that gave it to him told him that stuff. To me, it looked like an old wooden chest that pirates kept their gold and jewels in; locked up and buried deep inside a cave that nobody could ever find without some sorta old ripped up hand-drawn map. On the front of the chest, carved deep into the weather beaten wood read, ‘Dew110’. That’s it! Just ‘Dew110’. I wondered if it was some kinda pirates’ code, used hundreds of thousands of years ago. Being the typical curious kinda kid that I am, I hesitantly stood and just stared at the strange looking chest for days, maybe even weeks. A routine I did almost every morning since Dad left it in my room until one morning it began moving, jumping up and down, all by its self. I wasn’t scared at all. Why? I don’t know, but that day I opened the noisy chest and out they came for the first time. Again, they came bursting out, like a ten foot wave crashing on a beach all over my room. Wide open flashing eyes, looking right at me like young players looking up at their coach calling out the final game winning play. They looked game-ready; each one a champion at their sport. “Howdy Captain.” I turn looking down at the Football, who says he’s from Texas and calls himself First Down. I ask, “Why do you always call me Captain?” First Down, looking up at me from my bedroom floor, replies “Well, young Captain, who ever opens the chest becomes the new Captain of the team.” I immediately came back with a question, “What team?” Simultaneously, everyone of them sings, “TEAM DEW110”. It sounded like they had lots of practice answering that question. As I continued listening, I looked around my room at all the faces looking back at me. “We have been locked in that chest for many years hoping a young fella like yourself would find us,” First Down continues saying. “Why?” I asked. A reply comes from the crowd. “Bonjour Captain Does. So we can share our love and passion for what we do with you,” says Ms. Love, a tennis racquet from France. “But, I’m too little to be a Captain of anything,” I say. Mr. Mulligan, an old wooden golf club, moves toward me and with his soft gentle voice says, “Captain Does, you are never too small to lead.” Looking at Mr. Mulligan, I replied with a puzzled look, “How do I lead you guys?” It felt like this was going to become a long talk because Mr. Mulligan always repeated himself. Hours had passed, each story full of adventure with Mr. Mulligan and others explaining how they will teach and help me be a leader whenever I call on them. I wasn’t sure if this was my crazy, wild sports imagination, as my mother would say. Was this really happening? A toy chest full of talking sports stuff? I guess it made sense if you knew how much my Dad and I loved sports. I didn’t want to leave my room. I listened, adventure after adventure, until it was time to eat Thanksgiving dinner. My mother must have thought I was playing on my computer or something. Little did she know, I was talking to my new friends. Bend-It, the soccer ball from some part of South America, told me how he was the reason the Women’s USA Soccer Team won the World Cup. Cross Over said he taught Hardaway how to do the cross-over move, but Tim got all the credit. They were so funny. Each one had their own book of adventures, sorta like sports history 101 with a twist. I was sad that I had to leave them to go eat, but I promised that I would be back soon. I called down to Mom, letting her know I was on my way. It took a while, but I ate everything…twice! Mom said, “Dewey, you’re going to pop if you keep eating.” All I could think of was my new friends telling me, ‘eat and grow tall Captain Does.’ So I did. I couldn’t wait to get back to my bedroom to hear more exciting adventures. I finally finished all my Thanksgiving dinner. Grandpa Does, asked if I was going to join the rest of the family to watch the big game. I told him I had something to do and that I’d be down as soon as I can. “I’ve never known that boy to miss a Thanksgiving game before,” he said, looking at my mother. I excused myself from the table, moving like I was running the 40 yard dash up the stairs. I wanted to hear more. I opened the toy chest and again they came storming out, game-ready. I jumped up onto my bed, as if I was preparing for a bedtime story. I couldn’t remember ever being this excited for a Mom or Grandpa late-night story. This was sorta different, like I was listening to my Dad telling me one of his sport stories again. As I got comfortable on my bed, Flat Top, the surf board from Southern California, began sharing one of his adventures with me. I was so stoked, feeling the spray of the waves on me. As Flat Top would say, “Dude, you are shredding that wave.” It felt like hours, as I sat listening. My eyelids beginning to feel heavy as I slowly fell asleep at the sound of the crashing waves. “FOOD COMA,” my new team sings out as they retreat back to the chest, just before Mom and Grandpa Does open my bedroom door to check on me. “Food Coma,” Mom whispers, looking back at Grandpa Does. He reconfirms, “Yup, Food Coma, does it again. I am loving Dewy. Being a parent and an educator i recommend that you give these books for the holidays or just everyday reading. Great stuff. All kids need to be exposed to this brand. 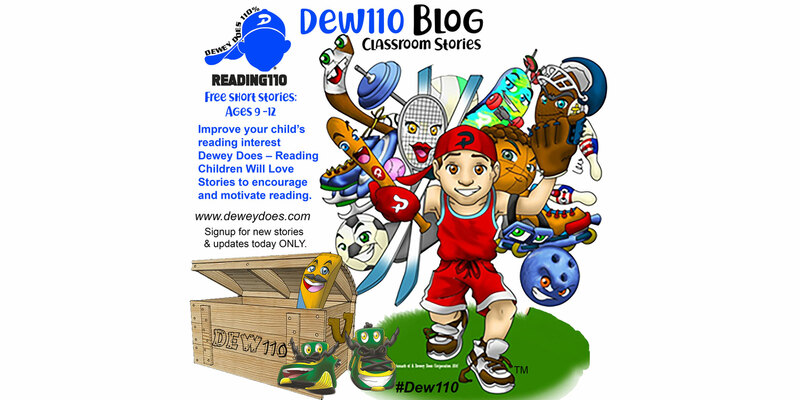 Both my kids 11 & 10 love the new Dewey Does short stories series. They can’t wait for the next one to come out! They’ve already read all three books in the Dewey Does Book Series and just can’t get enough of Dewey and his friends. Our children are in great need of being under the influence of positive role models. Dewey’s Does represents a very good example. Introduce him to your children and their friends. You may be pleasantly surprised by the results.